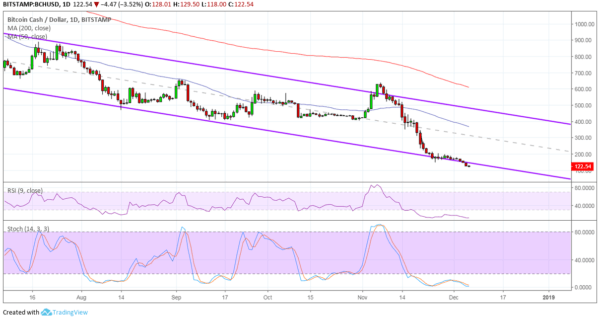 Bitcoin Cash Price Analysis: BCH/USD Steeper Decline in the Works? Bitcoin Cash seems to be unstoppable in its decline as it currently trades inside a descending channel and attempts to break below support. If this does push through, a steeper slide could be seen. The 100 SMA is below the longer-term 200 SMA to indicate that the path of least resistance is to the downside. In other words, support is more likely to break than to hold. A continuation pattern also appears to have formed at the channel bottom and a break below this could send Bitcoin Cash down by the same height as the earlier slide, which spanned 300 to 122.50. However, RSI has been indicating oversold conditions for quite some time, which suggests that sellers are exhausted at this point. Stochastic is also in the oversold region but is showing no signs of picking up just yet. This means that there might be no buyers looking to defend nearby support levels just yet. Bitcoin Cash was in a nearly nonstop slide following its hard fork and mining wars that ensued. Bitcoin Cash has reached one low after another and might be poised for more record lows from here. As it is, it looks like Bitcoin ABC is emerging the winner but Bitcoin SV proponent Craig Wright tweeting that the competition would continue until one side died. It’s hard to imagine any potential catalyst that could shore up BCH for the time being as opposing factions continue to bicker and exchanges face plenty of uncertainty on which version to support. Meanwhile, the mood in the general financial markets is also pretty grim as traders feel discouraged to take on riskier holdings like cryptocurrencies. Safe-haven demand is being bolstered by geopolitical risks, particularly relating to trade tensions and Brexit, so cryptocurrency traders might have to weather more losses before any signs of a rebound pop up, if they do at all.